The UH Libraries’ Makerspace, located within the Learning Commons on the first floor of the MD Anderson Library, offers a unique opportunity for students to collaborate, create, and learn. This specially equipped space provides tools and support for anyone working on projects, making objects, or building electronic devices. All students on the UH campus, regardless of their college or department, are encouraged to explore the space and all that it offers. The UH Libraries’ Makerspace offers five work “bays” that are open to individuals or groups to use when engaged in maker activities. A sixth bay offers access to high-end electrical measurement and testing equipment. Walk-up use and class reservations are available. *These hours may be affected by finals and intersession. 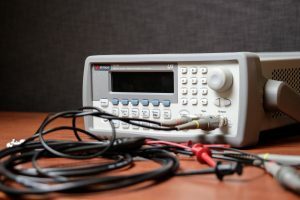 While students are welcome to bring their own materials to the Makerspace, the MDA Library also offers checkout of a variety of tool kits and low-power microelectronics. All kits are available for 2 week checkout and have $9/day overdue fines. For more information, view our complete Makerspace Kit Parts List (pdf, 4 mb). 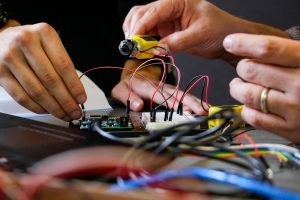 Students working on advanced electronics projects can request a custom microcontroller accessory kit through the “Makerspace Your Way” request system. To request a custom accessory kit, please complete our “Makerspace Your Way” request form. The UH Libraries’ Makerspace is available for reservation by current UH faculty for use with maker-related classes, programs, or activities. Reservations are made on a first-come, first-served basis and are subject to availability and approval. To request use of the library’s Makerspace, please complete our Makerspace reservation request form. Tell us your how you use the Makerspace or make suggestions for future maker services by filling out the Makerspace feedback form.